Exercising to boost your metabolism is likely the best natural energy booster to improve your health this winter season. Many of us go through periods of weakness and depression, especially during the winter season. Shorter days mean less sunlight. In turn, your body produces more of the hormone melatonin, which leads to sleepiness. The lack of sun exposure can also lead to vitamin D deficiency, excessive fatigue and depression. People also tend to eat more and exercise less during the holiday season. This leads to fatigue and unwanted weight gain. 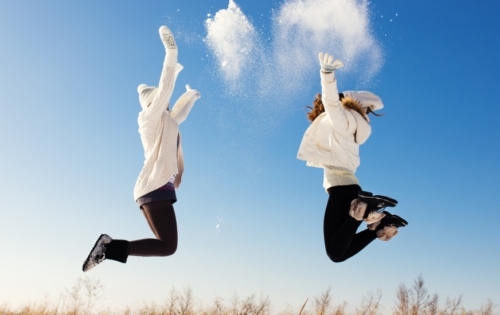 How do you become more energized and boost your metabolism during this time of year? Stay positive: When you feel good it is a lot easier to enjoy life and cope with stress. As a result, you will have energy. Exercise regularly: Choose exercises you enjoy. This will make it easier to continue a regular exercise routine. Walking on the treadmill or playing indoor racquetball may be a good place to start. Eat healthy: Healthy food is fuel that gives the body the energy it needs. It is a good strategy to avoid processed food as much as possible to help increase your energy. Many people rely on caffeinated beverages like chemical-ridden energy drinks for an energy boost during winter. A healthy diet, regular exercise, and a positive attitude are a good place to start in regards to staying motivated and energized through the cold, long, and snowy winter season. 1. Start your day with breakfast: You’ve likely heard that breakfast is the most important meal of the day. The right breakfast can be a good natural energy booster for your day and it will lower stress. Avoid a heavy or greasy first meal. Some healthy choices include rolled oats or a nutrient-dense green smoothie with spinach, kale, avocado, and pumpkin seed protein powder. 2. Increase your magnesium intake: Magnesium is essential for cellular energy production. Magnesium deficiency will also result in weakness and fatigue. Increasing your magnesium intake will improve adrenal function, decrease stress, and boost energy levels. Magnesium should be supplemented with calcium to improve sleep, and to avoid potential heart problems. 3. Energize with adaptogenic herbs: Adaptogenic herbs are some of the best natural energy boosters around. They help the body adapt to mental and physical stress. As a result, they will reduce stress, fatigue, and depression. Some of the most effective adaptogens include ashwagandha, Panax ginseng, ginkgo biloba, rhodiola rosea, licorice, Siberian ginseng, and ginger. Consult with a doctor before taking adaptogenic herbs to avoid potential interactions with medications. 4. Use aromatherapy: Aromatherapy can also help combat winter fatigue. Essential oils can greatly improve your energy and reduce depression during the winter season. Some good energy boosting essential oils include geranium, lemon balm, bergamot, neroli, and rosemary. Lavender oil is also a good choice for those who have trouble sleeping. 5. Get an adequate amount of sleep: If you’re not well-rested in the morning, it may be a good idea to look at your sleep patterns. The average adult needs between seven and nine hours of sleep every night. It is also best to go to bed before 10:30 p.m. to help ensure a restful sleep. Furthermore, designate your bedroom for sleeping. Having computers, TVs, and smartphones in your room will only interfere with melatonin levels and prevent restful sleep. 6. Practice stress reduction: A great way to decrease fatigue and gain energy is to practice stress reduction. A restorative yoga class is a good place to relax for 75 minutes of light exercise and body maintenance. Qigong, tai chi, meditation, and deep breathing exercises are also methods that lower stress and improve adrenal function to help boost energy levels. 7. Supplement with B complex vitamins: B complex vitamins are another way to receive a quick energy boost. B vitamins like B12, folate, and B6 are all involved in neurotransmitter metabolism. Vitamin B5 and B6 can also help improve adrenal function. Overall, B vitamins help boost energy levels, and reduce depression and stress. 8. Boost energy with homeopathy: Homeopathy provides more great natural remedies for winter exhaustion and depression. For instance, gelsemium is a great remedy for emotional, physical, and mental weakness. Cardo vegetabilis is a good remedy for low vitality, exhaustion, sleepiness, and sluggish behavior. Other mental and general fatigue remedies include arsenicum album, ignatia, aurum metallicum, phosphoricum acidum, silicea, and zincum. 9. Stay hydrated: When you are consistently sleepy and tired, there is a good chance you are also suffering from dehydration—so stay hydrated. Have a water bottle by your side at all times and drink at least eight glasses of filtered water daily. Make sure to consume plenty of warm soups and broths. Herbal teas can also go a long way to boost energy levels, including ginger and other aforementioned adaptogenic herbs. Avoid alcohol since it will cause dehydration. 10. Help others with problems: Sitting around the house and doing nothing helps contribute to the problem with fatigue, depression, and seasonal affective disorder. To augment excessive sleepiness and low energy, keep yourself busy by helping others. Try helping out a friend who needs advice or volunteer at a soup kitchen. Avocado: An avocado a day keeps the doctor away…should be the new motto of physicians. The avocado is one of the ultimate energy boosting foods. They are loaded with B vitamins, especially folate and vitamin B6. Organic eggs: Eggs are a great food for winter fatigue. Eggs are an overall excellent energy source, and contain vital nutrients such as protein, zinc, iron, and B vitamins. They are also a good source of vitamin B12. Rolled oats: Provided your body can digest grains, oats are a great food to boost energy and metabolism levels. They contain B vitamins, magnesium, fiber, and protein. Rolled oats and steel-cut oats are the best choices to boost energy. Nuts and seeds: Nuts and seeds are a great choice for boosting energy and metabolism. They are rich in fiber, protein, and B vitamins. Boost your energy with an assortment of raw nuts and seeds like almonds, walnuts, Brazil nuts, pumpkin seeds, flaxseed, and sunflower seeds. Wild salmon: Wild salmon is another major energy and metabolism booster. Salmon contains omega-3 fatty acids that help boost energy, focus, and attention span. Salmon also contains important energy boosting nutrients such as magnesium, protein, and B vitamins like B12. Dark leafy greens: Whether you blend them, sauté them, or juice them, dark green leafy vegetables are perfect natural energy boosting foods. They are all loaded with all the important energy nutrients, especially magnesium, zinc, and B vitamins. Great dark leafy green vegetable choices include kale, spinach, and Swiss chard. Exercising is a fantastic way to boost energy and metabolism. Metabolism is the chemical process where your cells produce energy to sustain life. Exercise becomes even more important for metabolism and energy as you age. There are a number of high energy and metabolism boosting exercises. Weight lifting: Strength training is necessary to build muscle. In metabolism, catabolism is responsible for the breakdown of muscle during a workout, and anabolism is the process necessary to build muscle. Your body also burns calories during rest. Your resting metabolic rate is higher when there is more muscle. After a strength training session, your muscles are activated. This process will increase your average metabolic rate each day. High intensity aerobic exercise: Aerobic exercise will not build large muscles, but it will increase metabolism hours after your workout session. High-intensity exercise will produce a larger and more consistent increase in your resting metabolic rate when compared with workouts of low or moderate intensity. High-intensity interval training will include short bursts of intense exercises like running, followed by a recovery period. Try a high-intensity class at the gym like Pilates or Zumba, or include jogging bursts during your walking sessions. Yoga: Yoga is a great way to boost metabolism and energy. The standing forward bend (Uttanasana) is an excellent yoga pose that can also relieve stress. To start this posture, stand and bend forward. Keep your knees slightly bent and allow your upper body to hang toward your toes. Take a deep breath and allow your spine to lengthen. Sunlight: Eat your lunch outside during your lunch break. Since sunlight is hard to come by in the winter, any time outdoors is valuable. Hydrotherapy: Try hydrotherapy to increase circulation and energy throughout your body. Relax: Whether it is meditation, prayer or reading a book, relaxing is essential to boosting your energy during the winter season. Thyroid checkup: It is a good idea to get your thyroid checked. Fatigue, weight gain and depression are all symptoms of hypothyroidism. Balch, J., et al., Prescription for Natural Cures: A Self-Care Guide for Treating Health Problems with Natural Remedies Including Diet, Nutrition, Supplements, and Other Holistic Methods (Hoboken: John Wiley & Sons, Inc., 2004), 166, 194, 359, 476, 488-489. Mateljan, G., The World’s Healthiest Foods: Essential Guide for the healthiest way of eating (Seattle: George Mateljan Foundation), 298, 476, 664. Bouchez, C., “Top 10 Ways to Boost Your Energy,” WebMD web site; http://www.webmd.com/women/features/10-energy-boosters, last accessed December 11, 2015. “Wipe out winter tiredness,” NHS Choices web site; http://www.nhs.uk/Livewell/tiredness-and-fatigue/Pages/winter-tiredness.aspx, last accessed December 11, 2015. “How to Be Energetic and Fun Loving,” wikiHow web site; http://www.wikihow.com/Be-Energetic-and-Fun-Loving, last accessed December 11, 2015. Hershoff, A., N.D., Homeopathic Remedies: A Quick and Easy Guide to Common Disorders and Their Homeopathic Treatments (New York: Penguin Putnam Inc., 1999), 161, 221.